Please note that the Contract for Sale has been amended to include Special Condition 8 and documents 7 and 8 of the Documents Schedule. A plot of city centre development land. Extending to approximately 0.018 hectares (0.046 acres). Operating Agreement in favour of NCPS. 40% revenue collected from 7 day car park. Financial summary available on request. Dublin 2 forms Dublins central business and retail district. The area houses many of the citys landmarks including St. Stephens Green, Grafton Street, and The Shelbourne Hotel. The area is well served by public transport connections including Luas stations at St. Stephens Green and Hardcourt Street, DART stations at Pearse Street and Tara Street, as well as multiple bus routes. The property is situated to the eastern side of Werburgh Street, close to the junction with Castle Street. Surrounding occupiers include The Lord Edward, Leo Burdocks and Jurys Christchurch. The property is arranged to provide a regular shaped site. The property has independent access off Hoeys Court. 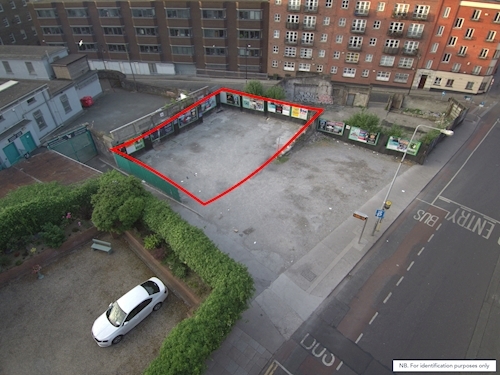 Total site area extending to approximately 0.018 hectares (0.046 acres). The entire site is occupied under an Operational Agreement to NCPS for a term of 4 years 9 months from 11.01.2016. The income generated is based on the revenue from a 7 day operating car park less management and maintenance fees. We have been informed by the Vendor that they are currently collecting 40% of the parking revenue. The agreement can be broken after 24 months by giving three months’ written notice. Under the Dublin City Development Plan 2016 - 2022 the site is Zoned "Z5" - To consolidate and facilitate the development of the central area, and to identify, reinforce, strengthen and protect its civic design character and dignity.